When Fox News first introduced its new news room full of ridiculously giant iPad-lookin' Windows tablets, our first question was "why?!" but now that the team has done a little journalism on Candy Crush, it's all suddenly crystal clear. 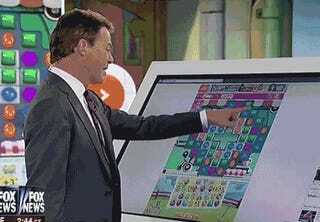 We know first hand that Candy Crush can be addicting, but Shepard Smith took the opportunity to explain that fact at length in a recent segment, making obvious, ridiculous, but actually kindasorta valuable use of his hulking tablet the whole time.